Here's a great recipe to prepare eggs with some Chilean flair! This dish was prepared by my friend Yumi and I love how the basil really adds to the flavor of the dish. It's perfect for vegetarians too! Preheat the oven to 400 F (205C). Butter 4 individual earthenware dishes or 1 large one. Spoon the corn mixture evenly into the prepared dishes. 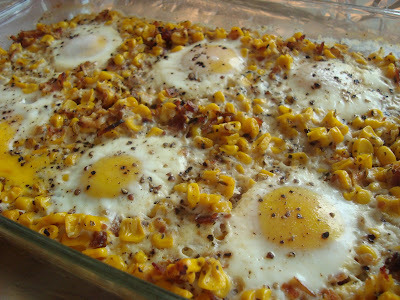 Make an indentation in the corn mixture in the center of each dish for the eggs. Carefully break 1 or 2 eggs at a time into a bowl, and let them slide into each indentation. Season with salt and black pepper, and dot with the butter. Bake 7 to 10 minutes, until the egg white is milky and the yolk is set but still soft. Serve immediately. i never has tried it , is looks so great. Look so good , i want try as soon as posible. This is delicious , a video preparing will help us a lot.